The Heinkel He 111 was the first genuinely modern bomber to see service with the Luftwaffe, although it was initially handicapped by a shortage of suitably powerful engines. Development of this important type began in 1934, with production machines finally entering Luftwaffe service around 1937. With continual development over a full decade, the Heinkel He 111 held the distinction of performing in front-line duties from the Spanish Civil War until the last days of World War II. However, the early variants were relatively short lived. These may easily be identified as having a conventional "stepped" forward fuselage compared to the all-glazed nose of later (and more familiar) variants. These early aircraft were withdrawn from operational service from 1938. Over the last five years or more, AirDOC has very effectively documented modern Luftwaffe types in addition to NATO allies over Germany. AirDOC now turns its attention to the wartime Luftwaffe. "Heinkel He 111 Part 1 - The Early Variants A-G and J of the standard bomber aircraft of the Luftwaffe in World War II" by Manfred Greihl is the fourth in their WWII series. The book commences with a bilingual text summary of development, production, and a technical description of the early Heinkel He 111s and a operational history with special emphasis on the Spanish Civil War. This opening section also includes a table listing the main sub-variants, their roles and powerplants, including prototypes and test aircraft. The focus of this series, however, is the photography. Contemporary photos are well reproduced and pleasingly large with plenty of useful detail on display. A full 36 pages are devoted to these images. All photos are accompanied by useful captions in both German and English. Even more interest is added to the book via eight colour profiles. One of these illustrations includes four-views showing the pre-war, four colour splinter camouflage scheme and markings on both sides, top and bottom. 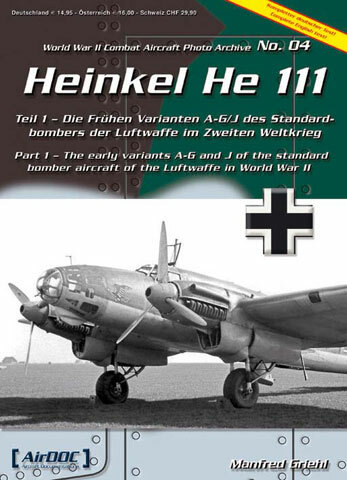 "Heinkel He 111 Part 1 - The Early Variants A-G and J of the standard bomber aircraft of the Luftwaffe in World War II" is an excellent modeller's reference for this the neglected early versions of this important Luftwaffe bomber.